In New York State, black bears (Ursus americanus) are the second largest mammal (the moose is the largest). A little over half of the state's black bear population is located right in the Adirondack Park. Although black bears are considered dangerous, they are actually one of the most elusive animals in the region and tend to avoid human contact. Whether they're walking on all fours or standing upright, black bears are large creatures. The average adult is between 4 1/2 - 5 feet long, and on all four paws, is 2-3 feet high up to the shoulder. While standing upright on its hind feet, black bears are 5-7 feet tall. Male black bears weigh an average of 200-600 pounds, and females only weigh an average of 150-250 pounds. Identifying markers on black bears include erect, rounded ears, a short tail, and a long, narrow, and brown muzzle. Most black bears are completely covered in black fur, but some may have a small white patch on their chest. In rare instances, a black bear will be covered in a brown or cinnamon coloring. Black bears are powerful creatures and can sprint short distances as fast as 30mph. They also have large claws that allow them to climb up trees. Aside from being great runners and climbers, black bears are strong swimmers too. Black bears live between 30-40 years in the wild, and they spend up to 5 months each winter season hibernating and remaining dormant. Breeding occurs beween late May through September, and cubs are born at the end of January or early February. For the most part, they are solitary animals that search for food alone. Females have a home range of 1-15 square miles, and males have a home range of 8-60 square miles. Bear dens are made in preparation for hibernation, and may be located in hollow trees, rock crevices or cavities, and under large tree roots. 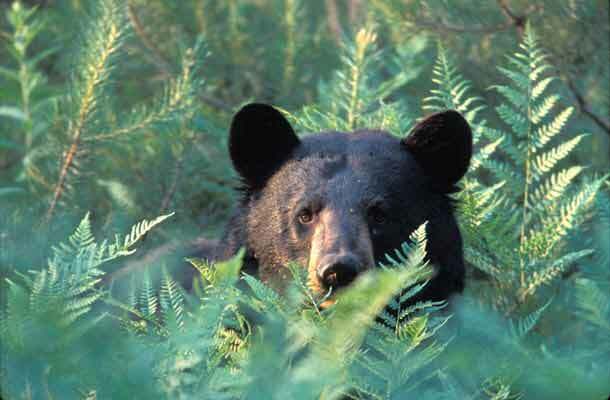 In New York State, there are about 6,000-8,000 black bears in areas open to hunting. It's estimated that 50-60% of the population is in the Adirondacks, with 30-35% in the Catskills, and the other 10-15% in central/western New York. Overall, black bears are found throughout the state, from forested regions and agricultural areas to semi-rural environments. Black bears are omnivores, or opportunist hunters. They usually eat plants, grasses, insects, berries, and other fruits. However, if the opportunity presents itself, black bears will eat small animals (reptiles, mammals, amphibians), fish, and human foods/products (garbage, bird seed, pet food, and more). During the day, black bears are most active around dawn and dusk and will wander in search of food. However, it's not uncommon for hungry bears to be spotted in the daylight. Throughout the year, black bears are active from late spring to late fall. The bears awake from hibernation in early April, but they have to wait for their digestive systems to recover after a period of inactivity. Then, around mid-November, when food sources become scarce, black bears begin to search for a den to stay for winter hibernation. Even if you take preventive measures to avoid attracting black bears, it's always a possibility one will linger around. Check out our six helpful tips to follow if you encounter a black bear, as suggested by the DEC. If it approaches you, raise your arms, back away slowly, and speak in a loud, clear voice. If it charges you, don't run, and use bear spray if you have it. If it follows you, keep moving and speaking loudly. Don't run, and stay in a group. If it doesn't stop following you, stand your ground, try to intimidate the bear, and prepare to fight with bear spray. If it makes contact, fight back with anything at hand. If you or someone you know has recently seen or encountered a black bear, then it's recommended to report the sighting to the DEC as soon as possible. Not only will it help increase public awareness about black bear activity in the local area, but the DEC will be able to take immediate action if necessary. Additionally, if you suspect someone is feeding black bears, then you should report the situation to the DEC before the bears become a nuisance to the local community. The DEC is split up into nine regions, and the Adirondack Park is within Regions 5 (Eastern Adirondacks/Lake Champlain) and 6 (Western Adirondacks/Eastern Lake Ontario). These two regions see a lot of black bear activity. To report a black bear sighting in Region 5, contact the nearest DEC office. For more information, email "[email protected]"
To report a black bear sighting in Region 6, contact the nearest DEC office. Black bears are normally shy animals, and many Adirondack locals may never see one in the wild. However, in 2016, there was an increase in bear activity during the summer and early fall seasons all over the Adirondacks (including Long Lake, Raquette Lake, Keene Valley, Saranac Lake, North Elba, and Fort Ann). In August 2016, DEC Region 5 wildlife biologist Jim Stickles told the Sun Community News, "This has definitely been a banner year for bear encounters in the Adirondacks." Stickles pointed out that black bear activity and sightings increase during dry years. Since 2016 was an especially dry year, black bear food sources were either not plentiful or dried up. As a result, more black bears wandered closer to towns in search of food, such as garbage, pet food, bird seed, etc. While rummaging for food, black bears may cause damage and appear threatening. During these periods of high black bear activity, it's important to keep in mind how to prevent and handle black bear encounters, as well as where to report a recent sighting.